R'Lyeh, the city where Cthulhu lays dreaming, his dreams manifest as a physical reality of the world we live in. His agents tap this Dreaming power and harness it for their arcane magicks. Imyr, the Dreaming City, where Melnibonean sorcerers utilize chaotic magicks to summon & commune with deities to do their bidding and manifest as physical reality the worlds in which they desire to live. To extents and purposes both cities are the same place. HAARP technologies access vibrational spectrum of energy that human minds can access through Dream, trance state, altered states of perception; the sorcerers mind. 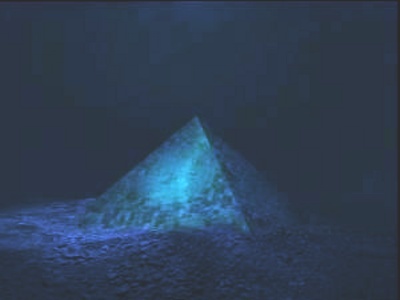 Crystaline pyramids built by the ancients perform the same functions. Their emissions effect physics of material reality creating a quantum grid that also affects the human mind; steering it, blocking it, focusing it to a particular waveform. We have had to worship deities who can perceive beyond this waveform. Some individuals for their studies are capable of performing the same function. It stands to reason that cetaceans are further adept than are land mammals. This is where the visionary art of HR Giger became my tool, for it accesses the same dimension as much of Lovecraft's writing and certain music. The Dreaming is timeless. When ancients spoke of sorcerers using machinations to access dimensions and commune with deities; very often it is us they were talking about. When medieval scryers spoke of a world in which demons were worshipped; it is our technologies they were talking about. A true understanding of "time" and "dimensions" as frequency harmonics rather than as a linear progression requires dismantling of the minds systematic approach to arranging perceived reality. the destruction of this systematic referencing considered 'normal' is what HP Lovecraft described as 'horrific'. His protagonists generally end up going crazy and running from the monstrosities of unsanity that the fragile, feeble human mind risks when attempting to see reality as it truly is; holographic and unstable; illusionary. The idea that something we trusted as an absolute was a trick, is scary to us. As an example I cite the many non-liberal, dogmatic and regarded 'normal' people whose marriage partner has had a secret long term affair. The fallacy of 'civilisation' process. ITSA is the Mayan word for the 5th Age. One translation defines it as; "city". Another translation defines it as; "Humanity", which is intended to be inclusive of the whole mokum of our social relations, paraphanalia, plans, acts and aspirations. From the heights of our high-tech rises to the basics of our food gardens to the trash heaps we build. From our spiritual ascension to our most depraved vampyric behaviour. From our emotions to our philosophies. 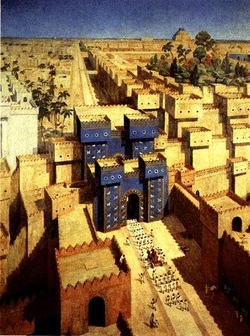 ISHTAR is the Assyrian / Babylonian Goddess of Love, War, Fertility. Hang a snake around a cross; The word, the symbol, becomes the same thing. The cross of War, the snake of Life. The concept becomes the same thing. The 5th Age will see us explore every facet until we all understand it, of living together, of community. At the end of the 2600 years, that is the next cycle of the Mayan calender, we will have ended War. The 6th Age is something different. It will follow linear from the 5th Age however there are some who are already achieved it because it does not exist in the same frame of reference as linear masstime. It is a high energy vibrational spectrum that surpasses the limitations of masstime. RE: comments here about his face being too long - people who do not understand art do not know the primal definition of the word 'drawing' means 2 things. Originally; 'to bring forth from a source' but the word is now generally used as in 'to make'. When dealing with spirit energy such as making a drawing (go to draw water from a well), the imagery manifests as intended. A good artist is a channel. Shaman (or eg; cthulhu priests), who recognize the symbolism here as a marker in reference to other items elsewhere. Although I can develop this in several directions including How I learned this stuff and Why I am making this statement,I will focus on the agenda; to teach. "Why the long face, Horse?" A Horse is a name in vodou cultures for the host, the spirit medium, the one 'being possessed', the 'priest', Amun. The vessel. I am sure that students of HP Lovecraft who know that he was inspired by his fathers research into Egyptian Freemasonry will be aware that 'the cult of cthulhu' is involved with such rituals. The connection between the possessed priest and the animal Horse is (at least) dualistic; not only does the spirit 'ride' the body of the host, but also the physics involved with such energy overlays means that the host can appear to facially shapeshift, typically stretched long upward because of how time/mass/gravity works with the aura or light-body on the upright plane. The tentacle in the background of the image is another signifier for this. I want to show you a picture of someone who you might recognize, all the horrors in your head come direct from him, the vortext of his tapping nyarlahotep comes through and I recognize it now as obvious, you reincarnated into you, I was sent to help. 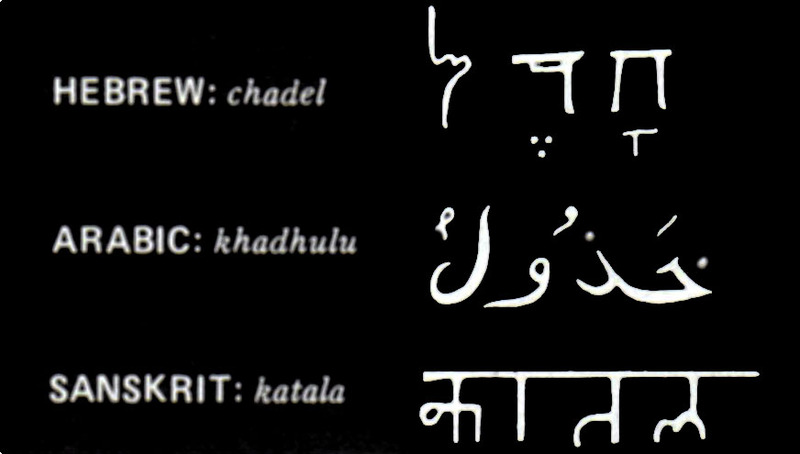 Deciphering his symbols into our experiences dealing with perceptions that go outside the safety net considered normal by most folk, is a part of shamanism. We are biological computers we are organic processors of realms of perception we are radios that have the wonky tuning to far out white noise and signals of chaos this is what cthulhu priests deal with and we have yet little words for but it is building the more we integrate the wisdoms hidden in history and from experience. It is no more a cult than is the tv media consumer slaves of mammon, politicians football fans or any other cohesion. It is a world view as all of us have only at best a limited world view, the cthulhu mythos when comprehended properly reveals stuff from outside of the zombies normal experiences that we have to deal with; internal to us we are connected to events out there. We resonate to stars whose energies are changing more than science can explain. These changes are the highways through which entities travel, these self-aware thoughts live within the arena of mind and use our energy fields to convey transmit and translate information about concepts foreign to human understanding. Only by guidance can we figure out what is happening. To call it 'chemical imbalance' is like calling the intricacies of a rainforests ecological systems and the lifeforms within it, and its role in oxygenation of the planet, and therefore wind and therefore evaporation of water and therefore rain and therefore filtered clean drinking water from springs and therefore cycles, seasons, therefore slow evolutionary change; to call all of that 'a tree' is the same as calling all of our astropathic biochemical shifts, a 'chemical imbalance'. It is like calling all of the content of every book in a library and what journeys they can take you on, 'mere words'. The purpose of shifting biochemicals from safety zone through uncomfortable experiences is to teach us where we are connected to abstract alien distant events because of how the gates of gravity work and the energy superhighway, because of what humans are, because of what life is. And what is happening to it at this time 2012 where the sun us flaring, where its harmonic is shifting. We are shedding heavy skins at the soul level because we are learning so much of the past thousand reincarnations is pointless now because we have assimilated the core concept and relegated it to instinct-reflex and let go, bulk-dumped the irrelevant ghafla we no longer require, but it doesn't fit into consumer society, it has no outlet like we used to have in tribal shamanic cultures, and those of us who do know what is happening are persecuted by those who want to control and impoise their limited grid onto other people, to reinforce their safety zone at the expense of learning reality. We only learn reality because we let go instead of trying to control it, and eventually we figure out what is happening, and try to explain it to others around us in an appropriate language. Concepts we have few words for but - in hp lovecraft the whole thing provides the words. Only to experience them as activities so you know for yourself the names for concepts for things that we go through in life. Is better to accept the jungle than chop it down and pretend it was wrong. If you ignore all my attempt to educate and heal you with wisdom then please at least youtube "chaldean frequencies"
"Cult" means "vision" and "ktlu" means simple: 'vision of abstract' and 'vision from abstract' because it is created for those of us who have been fragmented in timespace so we can see from a perception outside of and beyond linear time. This is called death-consciousness because when we die, we leave 'the matrix of mass-time' and go into the white-zone and from there through imaginal realms into wherever we feel drawn into, wherever we choose, wherever we resonate with most strongly that feels most real for us. 2 because we are approaching that level of evolution where we recognize the matrix is a hologram and that we can leave it in ways that the zombies are not ready to accept, so they try to repress any sign of it, typically using the word 'mad' - the path to being 'made'. They are idiots because they do not respect holy insight from shamanic experiences. They are the ones who snuffed the fire and called it satan when the first caveman learned how to make fire. Lucifer is the big bang it means 'most brilliant light' the matrix is made of it, the body of frozen Source manifesting through time. That's what the Creation is. By plugging into Creation, we get the magick powa to change things. Methods to do this are forbidden, insulted by the repressives. Cthulhu is the aboriginal dream serpent who symbolises Life, creation, to tribal shamanic cultures. 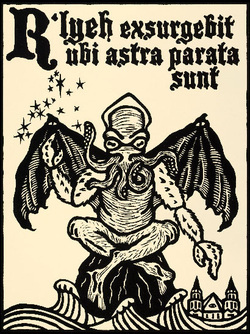 But on a bigger scope than only 1 planet; cthulu is many stars. When we vibrate high enough to break through the matrix, we either leave it entirely and go into dreamspace or else we warp it into the magickal realm for a while until the straights catch up and dissolve the higher spectrum. All the mental emotional anguish is shedding skin; you are connected astrally to cthulu shedding its skin, rolling in its sleep, dreaming a better now. The ego hates to die. have friends online who are a part of the same thing because, the story manifesting is bigger than any one of us. My internet friends - the ones who survived your onslaught to keep my path clear - also have the same spirit ally, are servants of the same path. Whether we are aware of it or not, and this is crucial to understand, if we choose to believe it or not, it is still real and is still happening. We describe it using comic book concepts like 'cthulhu" because its a frame of reference that is easy to deal with. Way-signs. It is much better because we are happier and with more power, to accept and to work with it, than to deny it. I know that from trial and error. I tested its reality and its depth and it won.